In May this year CFGN went to meet KMT who lives and works at ‘May Project Gardens’ in the suburbs of Morden in South London. We’d heard a lot about the project as KMT, a freedom teacher with a background in music, has turned his house and garden into a living permaculture space. 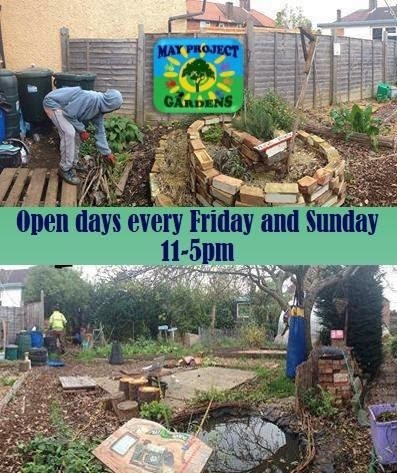 May Project Gardens was founded in 2009 on the site which has approximately 250sqm of growing space where a variety of fruits and vegetables are grown by individuals who volunteer their time to help maintain the project. On arriving at the gate it’s clear to see how much work has gone into the garden as it bursts with colour, plants and permaculture design utililizing all the different edges in the area. There is a medium sized polytunnel, a small herb garden, two large main crop beds, a wildlife zone (which includes a pond and a wild flower bed), a small food forest garden and four different composting systems. Volunteer days at the site are Fridays and Sunday 11am-5pm. The project also runs Permaculture and Hip-Hop courses courses and engages with Training for Transformation popular education practices.